It hasn't released new material in nearly two years, but Oakland's All Shall Perish is currently on the minds of a lot of people. About 64,000, at least. That's how many fans the band has currently amassed on Facebook, and the number keeps growing. (About 8,000 of those came in just the other week.) Earlier this year, Metallica's Kirk Hammett listed the band's Awaken the Dreamers as one of the best albums of the decade in Rolling Stone. And now, All Shall Perish is playing a handful of dates opening for Danzig, who personally called them and asked them to play. "He's a fan; we have mutual friends and he just heard about us," guitarist Ben Orum explained about landing the gig. (The band hasn't met him yet.) "Do we call him Glenn? Or Mr. Danzig?" Besides attracting some celebrity fans, All Shall Perish has incurred a similar rabidity in the metal community, especially among young fans. The band secured a prominent spot on the upcoming Summer Slaughter tour alongside popular acts like Decapitated, The Faceless, The Red Chord, Veil of Maya, and Cephalic Carnage, among others. Yet, oddly enough, the local scene doesn't seem to have embraced them as much as other locales. All Shall Perish frequently played venues like The Oakland Metro, but Metro General and Artistic Director Tom Dean says the band, which hasn't performed there since 2007, only drew about 200. "Crowd is tame, no pit, no stage dives," Dean said by e-mail. "I'd say LA has a way stronger metal scene than the Bay Area these days," said Orum, who added that he'd probably get flak from the band's local fans for such a statement. "You can see a clear difference when you play a show in LA versus Oakland. The crowd isn't as wild." The Bay Area certainly has no shortage of metal bands; in fact, it's a crowded market. The other day, this writer met a musician who had just relocated his metal band from Boston because of the strength of the scene. But there aren't as many mid-size venues to support them. With the absence of venues like The Pound and The Covered Wagon/Annie's Social Club, bands have to compete for spots at The Metro, 924 Gilman, and Thee Parkside. National acts stop at places like Slim's and The Regency Ballroom. All Shall Perish's difficulty locally could perhaps be attributed to the style of music the band plays. The Bay Area is of course known for its thrash bands (Metallica, Testament, Exodus). And, more recently, it's produced talents like Ludicra, Black Cobra, and High on Fire — who, although play different styles, are cut from a similar cloth and attract roughly the same fan base. But All Shall Perish plays a relatively newer (and somewhat polarizing) style of metal that combines elements of death metal (deep, gravely vocals; fast double-bass-drum pedaling; de-tuned and minor-key guitar riffs) with higher-pitched screaming, complex song structures, fast playing, complicated solos, breakdowns, and lots of palm-muting. Called "deathcore," it's a style that's conducive to moshing and beating the crap out of someone; hence, it's popular among young fans. Those lofty goals are kind of a rarity among metal bands, who tend to get more notoriety for their darker messages. The popularity of the recent documentary Until the Light Takes Us, about the Norwegian black metal scene, and the new album by Burzum (aka musician Varg Vikernes, a self-described Nazi who was imprisoned for murdering another musician and for burning churches in Norway), has brought to the fore an uncomfortable fact: Some of the best bands in the scene have some very unfortunate beliefs. It's an issue that isn't talked about very openly. "I don't share the views of, say, Deicide or Burzum, but will I listen to their music, sure, but I just pass by the lyrics sometimes," said Orum. "That goes back to what people take from songs and music. Some people read into lyrics or music. What it really all comes down to is how you're raised and how things affect you. A perfect example — my favorite band was Dissection. But then he [Swedish guitarist/singer Jon Nödtveidt] killed someone who was homosexual, went to jail, and then killed himself. I still pop in the disc, but do I think that guy's a total retard? Yes." Church-burnings and murder have fortunately never been on the agenda for All Shall Perish. The band was formed by Orum and bassist Mike Tiner in 2002, and after releasing its debut, Hate.Malice.Revenge, signed a deal with Nuclear Blast Records in 2004. Perhaps the toughest challenge the band has faced has been solidifying its membership. 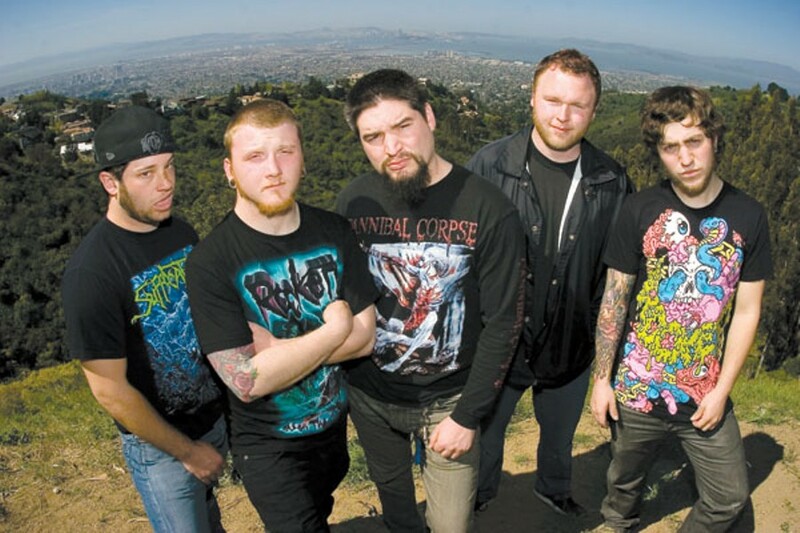 Original lead guitarist Caysen Russo and vocalist Craig Betit left after Hate.Malice.Revenge, and were replaced by Chris Storey and Hernan "Eddie" Hermida, respectively. Then last year, Storey left and was replaced by Jason Richardson. 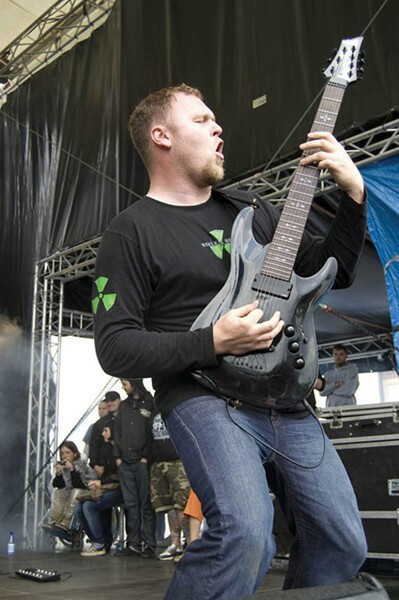 But no sooner did the eighteen-year-old prodigy join the group than he left to join another band, Born of Osiris, because the members were "more kids his age," according to Orum, who's in his thirties, married, and has two kids. Because of Richardson's departure, the band had to cancel a European tour with Machine Head. "That was probably the worst feeling of my entire life, having to cancel that tour," Orum recalled. Finding someone who can play technically demanding music isn't as hard as one might think. Metal musicians start young and practice a lot in order to keep up with the current skill level, which is quite high. "You can go on YouTube and you can find twenty, thirty kids who are incredibly good at guitar — they're just playing it by ear," said Orum. "It's an incredibly mental thing. That was the folly with Jason, he was only eighteen. He played the stuff phenomenal, but he was eighteen." The band eventually found a replacement, thirty-year-old Italian guitarist Francesco Artusato, who had been living in LA and teaching guitar for the last six years. Orum said the band sent him tablature for the track "Never Again," which contains the band's toughest solo. "He did it with ease within a couple hours and we were shocked. It was super clean." Yet soon after announcing the addition of Artusato, the band announced a new drummer, Adam Pierce, to replace Matt Kuykendall, who apparently no longer wanted to tour. Playing in All Shall Perish is undoubtedly a demanding affair, requiring lots of practice to master fast, complicated parts and keep the simple parts clean. "Before you go out on tour, you go out and practice a lot every day," said Orum. "Two solid weeks of practicing every day. Plus people practice on their own. ... It's all difficult and all requires a lot practice. Lots of practicing to a metronome. Once it gets to the part where it's really fast, then it gets to muscle memory. You'll be looking down at your hands while you're playing it and you're going, 'Wow, I'm doing this!'" Assuming the current lineup holds, All Shall Perish plans to write material while on the road for a new album to be released sometime next year. Orum says they'll likely continue working with Zack Ohren, who produced all three of their last albums. No doubt new lead guitarist Artusato will affect the band's future sound. "He's already sent us a bunch of ideas — almost like a throwback to our second album [The Price of Existence]," said Orum. "It's a lot less virtuoso-style guitar, a lot more down-and-dirty grooves. But a lot of brutality." The band also recently obtained some eight-string guitars — popular among many metal bands — thanks to a recently inked sponsorship with Ibanez. Orum says they may experiment with eight-string tuning on a few tracks, "but we don't want to do all eight-strings because it will change our sound too much." In other words, don't expect All Shall Perish to change anything too drastically. While the saturated scene has many bands struggling to differentiate themselves, All Shall Perish is content to stick close to its roots. "Our band isn't about trying to sound a different way — a lot of bands are like that now," said Orum. "All Shall Perish doesn't do that."